The congregation of United Church and the staff are honored to offer pastoral care and memorial or funeral services at the time of the death of a loved one, regardless of the deceased person’s formal relationship (membership) with the congregation. Services are reverent, uplifting celebrations of the resurrection and of the individual’s life. The Pastor presides at the service and may invite, on the request of family, another pastor to assist in the service. The Director of Music Ministries serves as the musician for the service and will coordinate other musicians or soloists at the request of the family. Simple service bulletins are printed at no charge. Other fees are based on whether or not the deceased was an active member of the congregation. It is required that funeral home staff be present at the service and the funeral home must confirm their presence with the church. It is the funeral home staff which provides ushers, parking assistance, arranges flowers, pictures, easels, guest books, and printed memorial cards. The building opens for family one hour prior to the service, when they can arrange flowers or pictures, if they choose. It opens one-half hour prior to the service for other worshippers. Audio and visual recordings are permitted in Fellowship Hall during the reception only. All equipment must be provided by the family or funeral home. 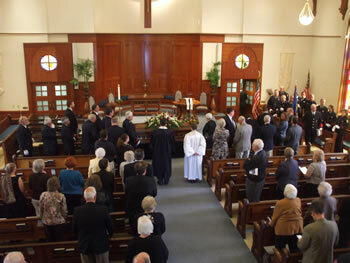 A reception at the church may be available when the deceased was a member of the church. A basic reception includes coffee, tea, breads and cookies. [Receptions end 1.5 hours after the conclusion of the worship service.] Contact the Reception Coordinator to determine availability. The United Church is handicap accessible. The building is a smoke-free environment and alcoholic beverages are not permitted on the church premises at any time. One way of providing a living memorial for your loved one is to suggest an appropriate memorial gift be made to the United Church of Fayetteville, the faith community of which he or she was a part and which is providing pastoral care to your family in time of need. If you choose to do that, each donor receives a note of thanks from the Church and you receive a list of those who have made a memorial gift in your loved one’s memory. His or her interests, ministries and relationships are considered in the use of these gifts at an appropriate time. Thank you for considering making UCF part of the memorial for your loved one. We offer services for those who are not members of the congregation as well as those who are. Fees indicated reflect whether or not the deceased was an active participant in the life of the congregation. All fees, are collected by the funeral home, which pays the staff and church. A surcharge may be added for services during the holiday periods and weekends. These minimum fees have been established by the Church Board of United Church of Fayetteville.